I love chippies too!! I usually feed mine peanuts but haven't seen too many of them this year...? Oh he's adorable! And I have hand-fed chippies at Ronna's place. I can't do that in our garden, as the dogs will go after chipmunks, so I don't want the chippies geting tame around me. They are so sweet. 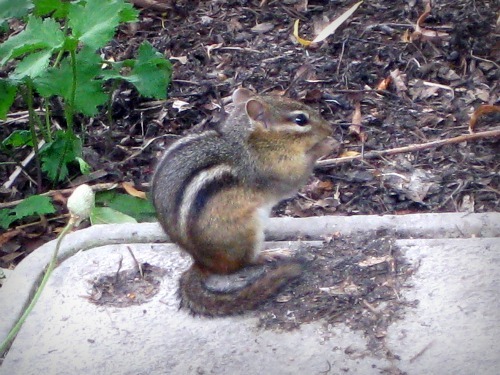 Normally the chipmunks I see near my house scamper off quickly and I can't get close. At the Botanic Gardens they must be used to people because they get surprisingly close. They are just so cute!